FFA - Shame on Brandeis University for siding with terrorist sympathizers (CAIR) over defender of terrorized women by withdrawing invitation to and award for Ayaan Hirsi Ali. Shame on Brandeis University for siding with terrorist sympathizers (CAIR) over defender of terrorized women by withdrawing invitation to and award for Ayaan Hirsi Ali. Please send your email to Brandeis officials. 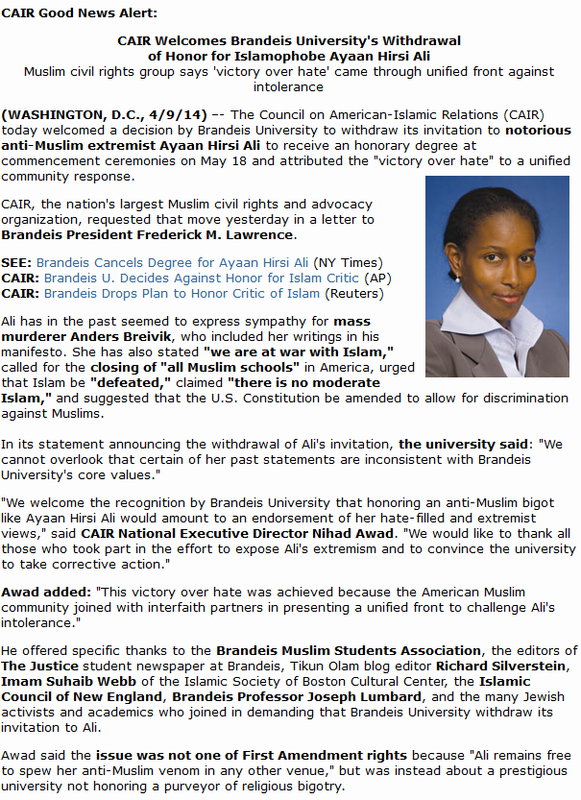 Brandeis University has been intimidated into withdrawaling their invitation and award to Ayaan Hirsi Ali by pressue from the Council on American Islamic Relations (CAIR). Sadly, Brandeis University pointed to some strong words that Ms. Ali spoke in response to Islamists' world wide usually demeaning and often vicious treatment of women. How would anyone feel if they were the victim of long term, severe violence by an organized group that is unapologetic for their gruesome, inhumane practices? It has been those strong feelings that have motivated Ms. Ali to defend the undefended. Florida Family Association sent out an email alert on April 6, 2014 which reported: The Council on American Islamic Relations (CAIR) is calling on their members to condemn the faculty at Brandeis University for choosing to recognize Ayaan Hirsi Ali with an award for defending Muslim women against Islamist honor violence. 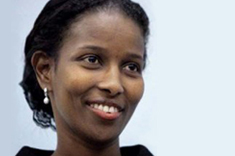 Ayaan Hirsi Ali is the Executive Producer of Honor Diaries and founder of the AHA Foundation. Honor Diaries is the first film to break the silence on honor violence. In response to ongoing abuses of women’s rights, Ayaan Hirsi Ali and her supporters established the AHA Foundation in 2007 to help protect and defend the rights of women in the West from oppression justified by religion and culture. 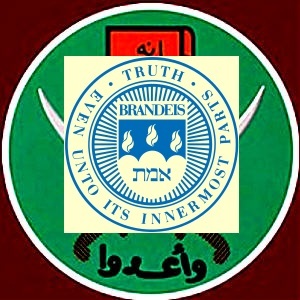 Brandeis University originally wrote regarding their decision to award Ayaan Hirsi Ali: "Somali-born scholar and women’s rights activist Ayaan Hirsi Ali escaped an arranged marriage, receiving asylum in the Netherlands where she worked in factories and as a maid before earning her undergraduate and MA degrees in political science at Leiden University. Having received citizenship, she served as an elected member of the Dutch parliament from 2003-2006, where she focused on furthering the integration of non-Western immigrants into Dutch society and on defending the rights of Muslim women. She campaigned to raise awareness of violence against women, including honor killings and female genital mutilation. In 2004 she gained international attention following the murder of director Theo van Gough, who worked with Ms. Hirsi Ali on her short film "Submission," about the oppression of women under Islam. The assassin left a death threat for her pinned to van Gogh’s chest. In 2006 she resigned from Parliament when the then Dutch minister for Immigration revoked her Dutch citizenship, a decision that was overturned by the courts and ultimately led to the fall of the government. Ms. Hirsi Ali is currently a Fellow with the Future of Diplomacy Project at the Belfer Center for Science and International Affairs and the Harvard Kennedy School and a visiting scholar at the American Enterprise Institute." CAIR announced in their email alert posted below that their demands have been met. Brandeis University has cancelled Ms. Ali. Florida Family Association has prepared an email for you to send to express disappointment to Brandeis University faculty for cancelling Ms. Ali.